We have some wonderful new neighbors, so we wanted to have them over for dinner along with another couple who has been in this neighborhood for 40ish years. Fortunately, we didn't need our plan B. Everything turned out great! Let it marinade...yep, on the wire. Just put the whole thing into the marinade you choose. We used a bunch of Tastefully Simple spices and some Italian dressing. 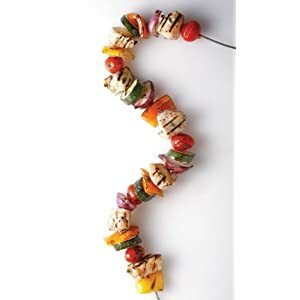 Now, just lay the whole kabob on the grill, and grill it like you normally would! YUM! ﻿Cook macaroni in boiling salted water for five minutes. Drain and pour into crock pot. Beat together milk, eggs, butter, salt, and pepper. Add to macaroni along with 2 cups of cheese. Stir will. Top with remaining cheese and cook on high for two hours. Here's a family favorite that was introduced by my sister-in-law, Natasha...This one is a Paula Deen recipe, but we just call it Tasha's Pineapple Casserole. Grease a medium-size casserole dish with butter. In a large bowl, stir together the sugar and flour. Gradually stir in the cheese. Add the drained pineapple chunks, and stir until ingredients are well combined. Pour the mixture into the prepared casserole dish. In another medium bowl, combine the cracker crumbs, melted butter, and reserved pineapple juice, stirring with a rubber spatula until evenly blended. Spread crumb mixture on top of pineapple mixture. Bake for 25 to 30 minutes, or until golden brown. Now if you haven't already, you simply MUST check out Pinterest. I'm fairly new at it, but I'm definitely hooked on it. You can see my pins and boards by clicking the button on the sidebar. In addition to all the crafty and organizing inspiration, I also find a lot of great RECIPES! We made this asparagus recipe that I found on Pinterest, and it was fabulous! ...And now for DESSERT! Our neighbors brought over a Mango/Key Lime pie. I'd never had that combo before, but it was mouthwatering. Make crust: in large bowl, combine cracker crumbs, sugar, cinnamon and butter; mix well. Press mix into a 10-inch pie pan, sides and bottom. Set aside. Make filling: in a food processor (or blender) process mango until pureed. Add egg yolks, lime juice and the two cans of milk. Mix, combining well. Fold in the diced mango using a rubber spatula to keep the mango intact. Pour mixture into crust and bake for 20 to 25 minutes. Remove and cool pie completely. 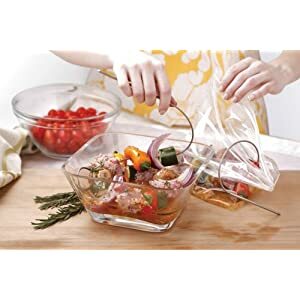 Keep refrigerated until shortly before serving. Top with fresh whipped cream. I sure hope you'll enjoy these recipes if you choose to try any of them. If you have them all together like we did, you'll be certain to have had one very delicious summery meal and a full tummy! Yay! YUM! I love home made guac! So much easier than you think, fresh & delicious!